Italian chef Massimo Bottura opened his sixth Refettorio community kitchen in Paris last week. The concept? To provide a sumptuous feast to the most vulnerable of Paris while also battling food waste. Don’t talk to Bottura about charity. For the only chef in Italy to earn three Michelin stars, his chain of restaurants – the Refettorii – is above all a community project. I didn’t want to recreate a soup kitchen where you have to stand in line. At the Refettorio, we serve them as clientele should be treated, with consideration and dignity, Bottura told FRANCE 24. In Milan, Modena, London, Rio and, as of March 15, Paris, the most vulnerable will not have to accept food handouts or face the frequently dehumanising soup kitchens. At Bottura’s Refettorio – which translates as recuperate or restore – they are invited to enjoy a delicious meal carefully prepared by a professional chef in a warm, convivial environment surrounded by exquisite artwork. On the opening day of our Refettorio in London, a 92-year-old woman told me it was the most beautiful place she had been to in her life. For her, we had created a community. And that’s the very essence of the project. We restore dignity for the forgotten with a stunning dining experience, the chef said. Do you know what the most important ingredient in a kitchen is? Culture! Bottura exclaims. Yet in a world where 1.3 billion tonnes of food is wasted each year, the link between a cultural experience and cuisine isn’t always obvious. From culture comes knowledge, and from knowledge comes awareness, and from awareness comes action. The Refettori aren’t soup kitchens because in our kitchens we’re not working with urgency. Our meals are a cultural, hopefully, life-changing experience. We’re trying to construct a better future. There are more than 860 million people who don’t have enough to eat: the goal isn’t to produce more, but to waste less, the chef said. 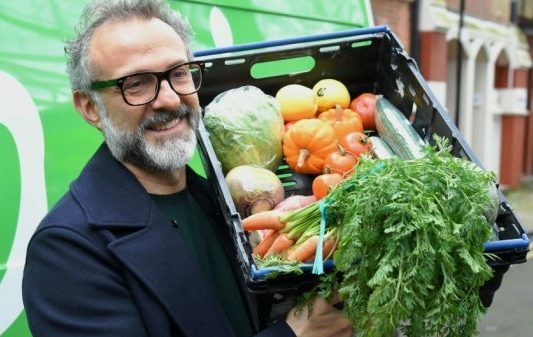 For Bottura, 55, a native of the northern Italian city of Modena, the birthplace of cucina povera or the art of simple cooking, the fight against food waste is almost innate. From his childhood kitchen table to his community kitchens, not throwing away food is instinctive. You can’t throw away bread – that’s sacrilege! Even stale bread can be used to make a delicious recipe, like bread pudding or pesto, explains Bottura, whose Proustian madeleine cookie recipe calls for one cup of warm milk, bread crumbs and a dash of coffee. Read full original article at France 24.